Social Marketing Company (SMC) is implementing USAID Marketing Innovations for Sustainable Health Development (MISHD) program. It is a five-year project for the period of October 17, 2016 to October 16, 2021. The goal of MISHD is to contribute to sustained improvements in the health status of women, children, and families in Bangladesh by increasing access to and demand for essential health products and services using social marketing tools and concepts through private sector. This program is being implemented in 65 Upazilas (sub-districts) of 17 districts where contraceptive prevalence rate is lower and child mortality is higher than the national average. Under this agreement, SMC and its partners are implementing an integrated social marketing program to provide a comprehensive range of products and services to the target population in Bangladesh. Implementing partners under this program includes: Concerned Women for Family Development (CWFD), Population Services and Training Center (PSTC), Shimantik. Technical and training partners under this program are Population Services International (PSI) and EngenderHealth (EH). Partners are working under MISHD to ensure a coordinated effort to achieve the project goal. 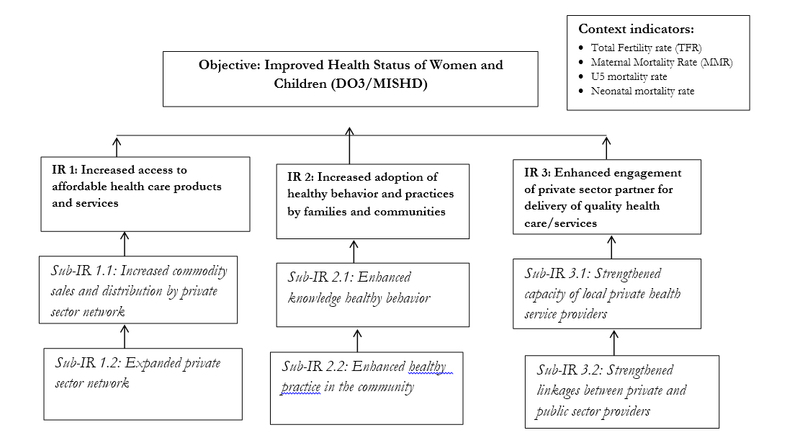 Following is the Result Framework of USAID Marketing Innovations for Sustainable Health Development Program. Under MISHD, SMC is working toward increasing use of its products and services, diversifying its product mix and strengthening its management systems. In line with this strategy, SMC is working as the lead agency together with key collaborating partners to ensure a coordinated and cost-efficient effort to achieve outcomes and the program goal, and strengthen the overall health system in Bangladesh.